Throughout the school’s history, George Washington University (GW) alumni have gone on to accomplish great things in their professional and personal lives. The most accomplished among the university’s alumni are singled out each year to receive the George Washington Alumni Association’s highest honor, the Distinguished Alumni Achievement Award. This year, two GW School of Medicine and Health Sciences (SMHS) alumni, André J. Nahmias, M.D. ’57, M.P.H., and Lieutenant General Nadja Y. West, M.D. 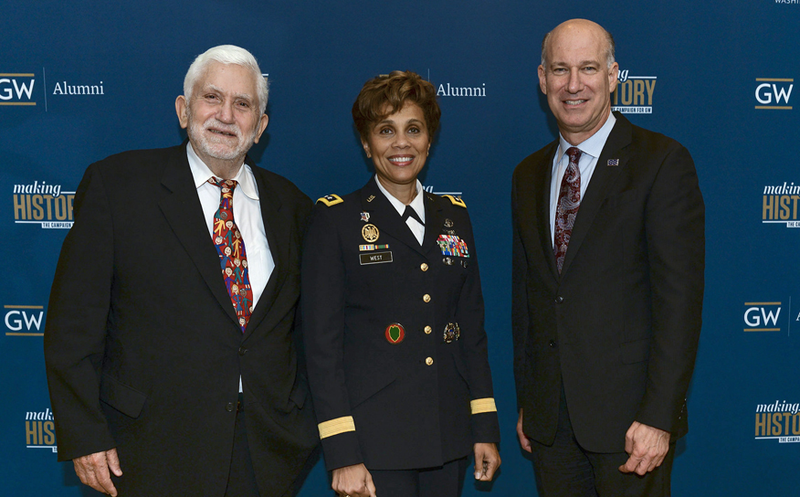 ’88, were among the recipients at the 80th Annual Alumni Achievement Awards ceremony on Oct. 27. Nahmias, an Emeritus Professor of Pediatrics and Public Health at Emory University, was honored for his contributions in research, clinical care, education, and child advocacy. Born in Alexandria, Egypt, he came to the United States to become a physician, earning his doctorate of medicine at GW in 1957. He later joined the pediatrics faculty at Emory. Nahmias dedicated his career to helping children, not only providing clinical care but also pursuing research in infectious diseases, which resulted in innovations in diagnosis, prevention, and treatment. Nahmias was introduced at the ceremony by Jeffrey S. Akman, M.D. ’81, RESD ’85, vice president for health affairs, Walter A. Bloedorn Professor of Administrative Medicine, and dean of SMHS. “As you go through your career, new diseases evolve,” Akman said. “With Dr. Nahmias, he was at the forefront of identifying and treating several important diseases.” Most notable, Akman added, were his contributions to understanding and treating the herpes simplex virus and HIV/AIDS. West is the 44th Surgeon General of the United States Army and Commanding General of the U.S. Army Medical Command. She is a graduate of the United States Military Academy at West Point with a bachelor of science degree in engineering, and she earned her doctorate of medicine from SMHS in 1988. In her career in the Army, she has served in many leadership and command positions at locations around the world. In his introduction of West, Akman highlighted the many groundbreaking moments in her career. “She is the first African-American to serve as the Army Surgeon General — a three-star billet. Her promotion made her the Army’s first African-American female to hold the rank of lieutenant general, and the highest ranking female graduate of West Point,” he said to applause from the audience. Like Nahmias, West was thankful for the people in her life who helped her throughout her career. “I relied on a lot of great people to steer me in the right direction: friends, colleagues, mentors, and, of course, family,” West said. She also expressed her deep appreciation of GW.